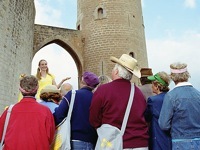 A tour guide faces her tour group. Tour guides have difficult, albeit enviable, jobs. They spend most of the day walking backwards, facing the group they are leading, talking about what they just passed. They have to know the route so well they can complete a tour without bumping into anything. If they lose their focus, or do not know the way themselves, I imagine it could be quite a scene. Leaders in the church do much the same thing. We face our congregation while we try to lead them on their lives’ spiritual journeys. We pastor-types tend to be technique-junkies. We read books on how to build our congregations, blogs on how to preach, and magazine articles on how to be more effective in our specific ministries. If not too expensive, we will even take a retreat to a remote location to hear from an “expert” about a way to do ministry. We might invest hours looking for the next big program for our congregation, our tour group, often at the expense of our own spiritual journeys. 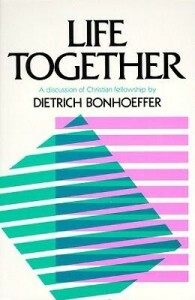 This occurred to me as I finished a section of Dietrich Bonhoeffer’s Life Together, which I am reading to prepare for an upcoming sermon, after having read a chapter of The Pursuit of God by A. W. Tozer earlier that day as part of my devotion time. Each of these classics is feeding my spirit in profound ways. I find I am not reading them for information, but because these two theologians are speaking into my life. My copy from my seminary days. Sometimes we forget church leadership requires a vibrant spiritual journey of our own. It is about more than being an effective leader. Good church staff members are also great followers of Christ. They are growing closer to God everyday. They are earnestly seeking to follow the way they have been called to lead others on. I want to ask you that same question today – How is it with your soul? Are you taking the time to be fed? Maybe its time to dust off that book you never read in seminary, the one on your shelf written by a famous theologian and give it a read – not to teach, but to be fed by it. Don’t get so focused on those you are leading that you lose your way yourself. They also know how to handle dumb questions with grace!